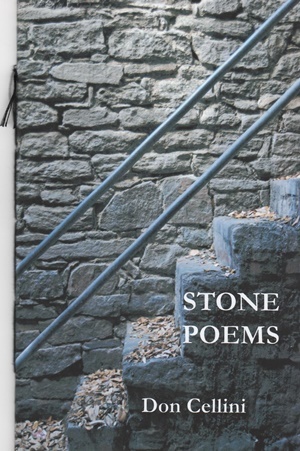 ​Stone Poems is a poetry collection by Don Cellini where stones are revealed as a profound symbolic axis for human existence. They are a symbol that encompass all things prior to life, as well as the course of human history and everything that will remain when we're gone. For "In the beginning/ there was stone;/ not earth and sky,/ not light and dark;/ neither creatures/ feathered/ finned, furry,/ nor hairy;/ no plants/ of any kind./ There was/ stone/ And the world/ was complete." The poems by Don Cellini create an ambiance of harmonious lyrical pantheism which generate a sense of sacred bond between these ancient artifacts and us; silent accomplices in the evolution of our character. For we have used them to create tools and fires to keep us warm, walls to keep us safe and even as a form of punishment. We have used them to build steps to walk on, temples to pray in and empires to rule civilizations. Stone Poems include sage-written verses that reveal the sacredness of that which lies beneath our feet. Additionally, after reading the book, you might feel the need to go outside and take the author's advice. "Pick up a stone,/ the ones/ found/ on the beach/ are best,/ the ones/ nearly worn/ flat and smooth./ Rub it/ like silk/ between your fingers./ Feel one/ thousand years/ of waves/ flow into/ your hand./ Feel the alleluia in/ your palm". Don Cellini (Toledo, Ohio) is a poet and renown translator of Latin American authors. He is the recipient of fellowships from the National Endowment for the Humanities and the King Juan Carlos Foundation. He is professor emeritus at Adrian College in Michigan. ​You can purchase Stone Poems through FootHills Publishing. Click here to purchase.